Have you been training? This Sunday April 8th is the first cross country race of the FloraGLO Island Cup XC series. 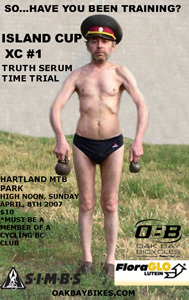 This race, presented by Victoria's Oak Bay Bikes is the 2nd running of the Truth Serum Time Trial. If a TT is the " race of truth " then this technical injection of mountain biking mayhem is truly the serum to get the truth out! The race will be held at the Hartland Mountain Bike park off West Saanich road in Victoria BC. The race will consist of the highlighted technical trails of the CRD park. This is a singletrack racers dream, with some of southern Vancouver Islands best trails in the course. Last year's winner Max Plaxton of the Rocky Mountain/Haywood team has given this year's course the thumbs up, and he'll be back with a new chain to defend his 2006 win. Other racers expected to be there are Plaxton's team mate and last year's runner up Seamus McGrath, 2006 Canadian DH champ Andrew Mitchell will be busting out the lycra on his Cove Hustler and, of course, Trish Sinclair. Registration will start at 10:30 ish ( it IS a bike race ) and racing will get off at high noon. The race is a paltry 10 bucks and the Kaiser from Oak Bay Bikes will be slinging free burgers on the BBQ. Racers MUST be a member of a VIMBA and Cycling BC affiliated club. The FloraGLO Island Cup is a wicked grassroots series that has fun races in all of Vancouver Islands singletrack hot-spots. The FloraGLO Island Cup is part of Cycling BC's commitment to grass-roots style racing and fun events. For more info e-mail Matt@oakbaybikes.com or check out www.oakbaybikes.com for series schedule.